We often (and rightfully) place Mario Bava at the forefront innovation. Whether he was melding classical gothic horror to his signature phantasmagoric aesthetic (Black Sunday, Kill Baby Kill) or innovating an entire genre altogether (The Girl Who Knew Too Much, Blood and Black Lace), Bava was more than just a godfather—he was something more akin to a singularity that spawned and defined so much of the horror genre during his own era and well beyond. Without Mario Bava, it’s likely any number of your favorite horror movies would have never been made. But like many of his fellow genre directors, Bava cut his teeth working on cheap knock-offs of popular trends (Roger Corman would practically run an entire film school/studio on this model). Serving as a cinematographer for over a decade before helming his own picture, Bava floated through several prevalent genres ranging from sword-and-sandal epics to vampire films. A few of these would be in the employ of director Riccardo Freda, an unsung figure in the annals of genre filmmaking, if only because he spotted Bava’s immense talents and forced his producer’s hand on Caltiki, The Immortal Monster. The story goes that Freda knew his cinematographer would only get a shot if he bailed on the production and left his director’s chair open. That’s pretty much exactly what happened about halfway through Caltiki, leaving the world with a cool moment in history that yielded Mario Bava riffing on Quatermass and the 50s monster movie craze. And I don’t know about you, but that sounds pretty goddamn amazing to me. For the most part (read: the parts Bava had the most obvious hand in), that enthusiasm is well-founded. Sure, Caltiki is an obvious knock-off of other movies: in addition to Quatermass, its effects recall the likes of The Blob, and there’s even a dash of Night of the Demon lurking in its chiaroscuro compositions. Its story is also familiar enough: during an excursion for artifacts, a group of archeologists stumble upon a shrine to Caltiki, a vengeful Mayan goddess that may or may not have been involved with the civilization’s decision to migrate centuries earlier. When one of the group dives into a pool in search of treasure, he surfaces as a decayed corpse. The culprit—an amorphous creature of some sort—soon follows, and, despite the team’s best effort to destroy it by ramming it with a tanker truck, it latches onto one of them (Gerard Herter). In the Quatermass tradition, the close contact with the radioactive creature begins to slowly drive Max Gunther insane—and this is not to mention the approaching comet that’s continuing to power the blob into something even more deadly. Obviously, Caltiki stuffs a lot into its scant 76 minutes, much of it familiar as hell. As such, it moves with a purpose, especially whenever effects work is involved. One of the somewhat conflicting stories surrounding the production insists that Bava specifically directed sequences involving the effects, while Freda handled everything else; whether that’s true or not, the finished product at least seems to bear out that Bava was at least more invested during those scenes. Cut from the same cloth as most of the American films in this cycle, Caltiki mostly functions as a showreel, and it’s one of the more noteworthy in that respect. The blob representing Caltiki is nifty, and Bava crafts it into a genuine menace as it crawls its way through, around, and over miniatures. Despite a relatively limited scope and a low budget that keeps the action confined to a handful of mostly rural locations, Bava nonetheless squeezes some scale out of it. One scene involving an army unleashing tanks and flamethrowers on the beast that feels straight out of a Toho production, and the blob itself nimbly evolves throughout the film until it finally becomes a primordial, oozy menace. Most importantly, there’s a texture to it all, from the blob itself to the gruesome, skin-melting gore gags: this is genuine craftsmanship on display, and Bava’s commitment to building this funhouse extends to the intricate matte paintings and elaborate sets. No, it doesn’t exactly deliver on the poster’s promise that a Kaiju-sized Caltiki will conquer an entire city, but Bava does deliver a reasonable facsimile of the films he’s been tasked to rip off. Much of the other half of the film—you know, the bits where it has to slow down and deliver clunky explanations via some fairly unremarkable, wooden performances—can charitably be described as functional. Most importantly, it stays the hell out of the way for the most part. There’s an entire subplot devoted to Gunther’s attempt to steal his colleagues wife away that’s presumably meant to add to the drama that really only serves to highlight what a deranged scumbag he’s become, which is fine. That Herter practically steals the film away from his co-stars is also fine—he’s certainly much more interesting than John Merivale’s square-jawed hero, who spends most of the film unraveling exposition. In contrast, Herter delivers the type of brooding, unhinged turn that Bava would coax from performers in his later films, and it lends a bit of a sinister streak to the otherwise lightweight Caltiki. Bava’s cinematography duties—which he wouldn’t often relinquish when directing those later efforts—are also evident. The elegant, measured black and white compositions that would define Black Sunday are most notably on display here, so Caltiki has a bit more of a gothic bent than most of its contemporaries. It’s a small but crucial wrinkle, one that not only sets the film apart but also fashions a moody, eerie atmosphere out of its inky shadows. Caltiki the Immortal Monster looks exactly how you might expect a Bava monster movie to look from this time period, and it’s fairly glorious. And that’s one of the great little surprises about Caltiki: it might be an embryonic effort working within the constraints of sausage factory B-movie filmmaking, but Bava’s fingerprints are all over it. Better yet, he doesn’t shy away from the task. This is an unabashed little creature feature that unspools its effects and gags to delight its audience—no more, no less. Even if it doesn’t carry the momentous weight of Bava’s later landmarks, it’s one of the earliest glimpses at his distinctive strain of genius. After all, before you can turn a genre inside out, you first have to become familiar with its working parts, and that’s what this feels like: Bava finally being gifted a sandbox and acquainting himself with the tools he’d later fashion for the revolution. 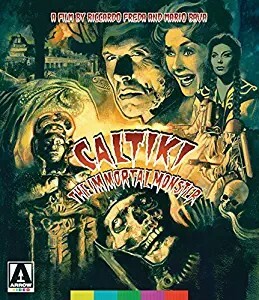 Despite hailing from one of the masters of horror, Caltiki had been unavailable in the United States on DVD and Blu-ray until Arrow Video’s recent deluxe release. It’s a nice set, starting with the impeccable presentation: this is one of those transfers that reminds us just how terrific a black and white picture can look when it’s meticulously restored. Seriously, this is top notch work, especially considering how obscure the film is. Both the English and Italian soundtracks are delivered via LPCM, though the former ranges in quality due to a lack of original elements, per Arrow’s disclaimer. The extras lean towards the scholarly side, as two separate commentaries from noted Bava experts Tim Lucas and Troy Howarth deliver a wealth of knowledge on the director’s career and Caltiki in particular. “From Quatermass to Catiki” allows film critic Kim Newman to join the party with an 18-minute lecture about the context surrounding the film and its production. It’s a nice little jaunt through the entire 50s monster movie cycle, with Newman making interesting points about its evolution along the way, with Quatermass and The Thing from Another World serving as the twin genesis points. Arrow also carries over a couple of previously produced features from an Italian DVD release. A conversation with critic Stefano Della Casa gives Freda his due, while Luigi Cozzi provides an account of the film’s production as well. A few other curiosities finish out the disc: one is an alternate opening titles sequence, while the other is a full aperture transfer that allows viewers to glimpse more of Bava’s effects work. Clearly, Arrow knows what the draw here is. This isn’t being reductive so much as it’s being honest: sometimes, you just want to see an amorphous blob melt the flesh off of its victims, and Caltiki delivers that first and foremost.